The title that I had originally in mind for this post was Tigers and Horses. It's snappy and, I thought, wonderfully topical. Tigers and horses are what flash up in my mind when I think of Ireland, an island roamed, in my imagination, by both – Celtic Tigers and feral horses. The tigers need no introduction. They were all the rage in the decade around the millennium, something to do with economic miracles and ferocious growth. I never understood how an economy could be based on Tigers – except by grinding their body parts into potions according to the laws of traditional Chinese medicine. Ireland is not a sham-pharmaceutical powerhouse, but the image stuck. Ireland's economic growth of the late 90s was initially based on luring global companies with lucrative tax avoidance schemes, a hollow success not anchored to the place at all. The share of the profits that trickled down to the locals was very much anchored to the place but hollow all the same. Wealth was locked up in bricks and mortar that turned out, years later, to have much less inherent value than was ascribed to them. The feral horses are related to this. I had once read in a Sunday supplement that Ireland's newly impoverished nouveaux riches let their equine possessions loose when the property bubble burst. Suddenly, appreciation on the third home out in the countryside wouldn't pay for the hay anymore. The most pitiful victims of the crisis couldn't keep the third home at all because their imagined wealth was only enough for the first two. The horses had to go. The story goes that they took to Ireland's green hills as any tourism marketer hopes foreign visitors would. I properly visited Ireland for the first time last weekend. I had been to Dublin a few times before but not got out of the city much. I have toured Northern Ireland, but living currently under the Her Majesty's scrupulous gaze, I have to insist that that's something else entirely. Last weekend introduced me to the Republic of Ireland, a land of small towns, raw shores and cruel weather whipped up by the unforgiving North Atlantic. It was supposed to be a summer holiday. As we drove west from Dublin, the radio gave hope. The topic was milk. Despite economic diversification and development, Ireland is agricultural at heart. Everybody understands farming. What no one understood, the radio reported, was that milk turned sour so rapidly these days. "Is our milk not what it used to be? ", a caller asked, "Or is it because of the great heat?" It was indeed sunny, but I didn't see the asphalt burn up ahead. No one goes to Ireland to find summer. I had expected rain and lashing winds. We got that in buckets on our drive back when the tail end of a tropical storm whipped us along, but the first three days were quite pleasant. We hiked and biked and drove around, and didn't get wet once. The sun shone so hard that I got burned, but it was only moderately warm. Even on the bike, I didn't break a sweat. Irish heat is different from proper summer heat. In the car, the radio host had moved on to the weather forecast and the news. The temperature was supposed to rise to 19 degrees. Milk was in grave danger. A public health announcement dispensed advice: "Do not store milk bottles in the door of the fridge because they will be in the middle of the room whenever you open and close the door." 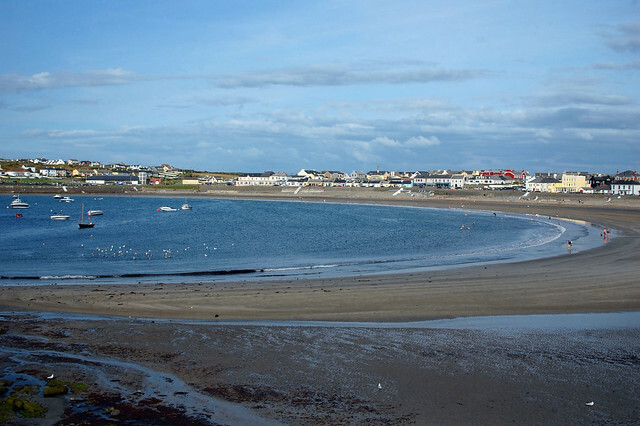 We stayed in Kilkee, a small town on the west coast that used to be a holiday destination in Victorian times – known as such even in Ireland, which doesn't care for Queens much otherwise. It hasn't changed much. If anything, things have moved backwards. The railroad from Ennis was ripped out years ago. Holidaymakers fly down to Spain now. Kilkee is for locals. My friend's boss has a holiday home nearby whose shed would give us shelter for a few nights. As we drove into town, a soothing voice on 2fm informed us that it was busy times on Irish roads. It was the annual road safety appeal put up by the Irish Farmers' Association. Thirty seconds of trivialities on hot rotation throughout the day. "Be on the look out for tractors, trailers and other farm machinery. Pass farm machinery only when it is safe to do so. To drive a tractor, you need to hold a license." I hadn't seen a combine harvester all day. We were welcomed to Kilkee by family friends, warmhearted folks who gave us not only a key to the shed but also a plate of muffins and scones with butter and strawberry jam. I would have called this tea, the most English of meals, but it was most definitely Irish. The husband, a jovial fellow in his sixties, friendly to a fault, replied "That's grand!" to nearly anything we said. He gave us a handful of brochures on the area and pointers on the town. Kilkee snuggles around Moore Bay, which not only protects it from the forces of the Atlantic but also provides a sweeping beach that becomes almost circular at low tide. Out in the mouth of the bay, rocks surface that break the waves and leave pools perfect for an undisturbed dip if you don't mind the temperature of the water. In the distance, just out of reach to the north and south, loom the cliffs that the Irish west coast is famous for. The bay is shallow and the tides are vast. There's a sea-side promenade, but only residential homes face the water. Business, except for two carts selling winkles and dillisk, happens on a street further inland – on one street, to give an idea of scale. Pride of place is Noughton's, a pub with fine dining ambitions that was recommended by our hosts for its seafood. The first time we went down there, on our second night, it was full. The second time we were more modest, asking for a reservation for the next night. We were sent packing again. Saturday was fully booked. We came again anyway, early in the evening, and the place was empty. It is entirely possible that what we ate there was the best meal possible in Kilkee. I have no reason to doubt that. But it wasn't very good. A much better proposition was the Diamond Rocks Café, on the edge of town. It was the only place that overlooked the bay and had a terrace that befitted its location. We came for breakfast every morning, a well-deserved treat after a stiff cliff run to start the day. Sitting on the same table by the panorama window soon after the café opened, we became regulars within three days. On our first full day, we drove north to Moher, the highest cliffs on the island and a top tourist attraction with charges to match. Our desire to avoid the official parking lot (charged at €6 per person) was met with local entrepreneurial spirit. We turned into a country lane that took us to a gravel pitch, a four-mile cliff walk away from the visitor center. The gravel pitch was a local farmer's business venture. He had opened up part of his land to tourists, to a good return on little investment. He also sold drinks and snacks in an effort to diversify. The Irish agriculture is worth €12 billion a year and one of the few things the country can rely on economically, but these days all is not well. A few days before our arrival, the EU had toughened sanctions on Russia. Now Russia was hitting back, banning all agricultural imports from the EU. This caused grave concern. Russia was an important market, but amidst growing despair, the good news was reported on the radio that unlike the milk that's its source, the industrially extracted and purified protein casein was not subject to import restrictions. French, Italian and English cheese would soon be unavailable in Russia, leaving industrially reconstituted imitation cheese to reign supreme. Putin had decided to stick it not only to the west but also to his own people. It's hard not to read this as a reflection of his character. 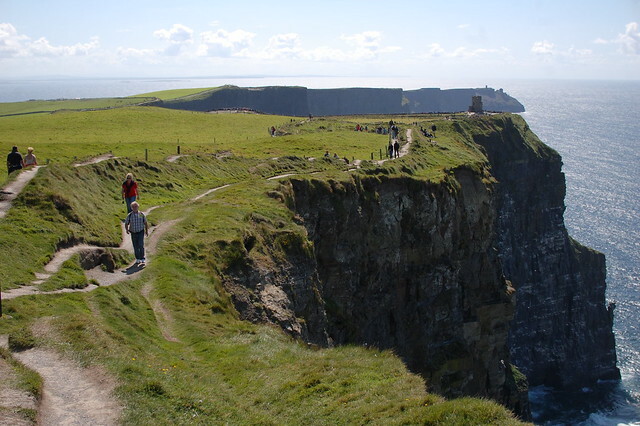 The Cliffs of Moher are impressive, but I found the area just north of them even more remarkable. 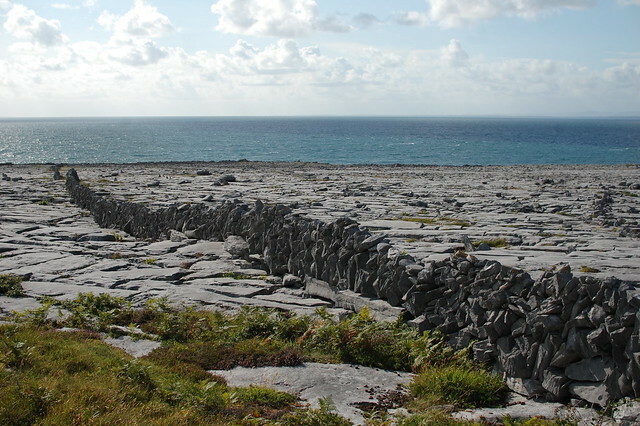 The Burren is very different from the Ireland of popular imagination. Instead of green pastures and rolling hills, there is exposed rock from the sea to the hills, largely flat and criss-crossed with bisecting fissures that create a rhomboid pattern. There were signs to explain that the blocks of rock are called clints and the fissures grikes but none to reveal how the latter were carved into the former. 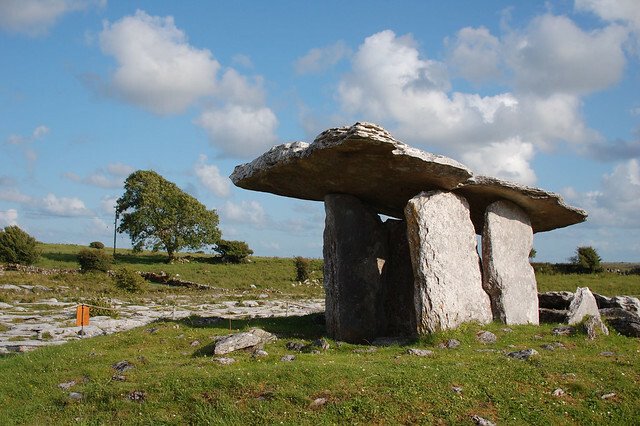 The Burren used to be fertile land, a long time ago, the limestone hidden underneath a layer of rich soil that sustained Celtic villages. Walls of stacked fieldstone remain as silent witnesses of the past. They used to be field boundaries for thousands of years. Today, they're absurd divisions in land with few distinguishing features. Botanists are drawn to the grikes, full of curious species. Tourists keep their eyes open for stone forts and paleolithic tombs. Outside the Burren, abandoned rock of later vintage was much more common, leftovers from the property madness of the recent past. Houses for sale in forgotten places are left to rot. Some building sites haven't seen activity in years, unfinished investment opportunities that it will take another bubble to resuscitate. Many of the new houses we saw were staggeringly ugly, the hope for quick profit apparently the only driving force in their construction. They often sat on vast patches of concrete or blacktop. Together with insipid vinyl siding and a complete lack of character, they looked more like orthodontics clinics in American strip malls than homes. The new properties were a regrettable but almost negligible visual nuisance. The west of Ireland is sparsely populated. Nature dominates, though in a shape chosen by humans over time. The coast is for the most part unspoiled. Most of the land is green and gentle. Here and there we saw horses grazing contentedly in paddocks, rather well fed and groomed, in good care of their owners. Tigers proved more elusive. A Polish grocery store in Portlaoise showed off a pyramid of energy drinks. On each can was a tiger, though only the word, not the image. Three cans were on offer for €2. Maybe there's a metaphor somewhere here for the future of Ireland. The beast from the east is trying to succeed the Celtic tiger, but on the conditions and to the benefits of the Irish.